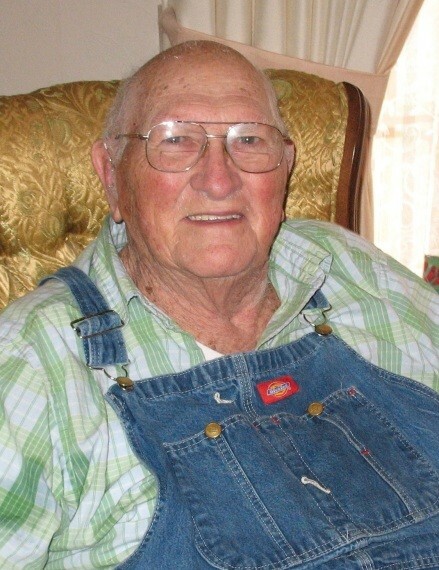 Harry William Kyle went to be with the Lord on Monday, December 3, 2018 in Cameron, MO. His spirit is carried on by his five children, nine living grandchildren, 15 great grandchildren, one great-great grandchild, two surviving sisters, and an extended family of relations and friends from every walk of life. We were blessed by Harry during his 98 years. Harry had an unwavering faith in God which showed through his joyful and gentle spirit and great devotion to his family. He leaves behind a legacy of love and laughter. Harry was the fifth child of seven born to Lark and Ethyl Kyle on the family farm in LaCygne, Kansas. He took great pride in being the Kyle who had lived the longest, and his goal was to live to be 100. He served in the U.S. Navy during World War II. It was while he was in training that he met and married Shirley Gertrude Simon. Together they raised five children. He had a life-long love of gardening and shared generously with friends and family. He especially enjoyed his homegrown canned green beans, turnips, Concord grapes, tomatoes, and corn. He was a tireless game player and puzzle solver. Scrabble, dominoes, and Farkle were some of his favorites. Harry believed that everyone should be able to drive his car as fast as he wanted if no one else was in sight. A few years ago, Harry surprised a local patrolman who thought he was pulling over a hill jumping teenager; instead, he stopped a very senior citizen for doing over 100mph. Aside from his interest in hill jumping, game playing, and gardening, Harry was a devoted Christian and always involved in his local church. He especially enjoyed singing and writing hymns. Harry took fashion cues from no one. His signature every day look was all his: a plaid pocketed shirt designed by the fashion house of Walmart, his Big Smith multi-pocketed denim overalls and a pair of old school tennis shoes that were usually paired with a stained cap or hat of some kind. He was authentic and true, an inspiration to all of us. He is survived by: son Jim (wife Dar, his children James II & wife Denise, and Sonja & husband Ben); son Joe (wife Sharon, children Joe & wife Kelli, John & wife Rebecca, and Jared & fiancee Lexi); daughter Harriet; daughter Lisa (husband Paul Murray, her daughter Charleen & husband Fred Phillips); daughter Hazel (Partner Doc, her children Tammy & husband Jim Tran, Chris Freeman, Mindee & husband Brent Neff); great grandchildren: JR(James III), Addison, Matthew, Avery, Nathan, Casey, Haley, Tara, Travis, Megan, Kim, Andrew, Jacob, Devin, and Conner; great great granddaughter Lainee; sisters Betty and Norma; and many in-laws, nieces, nephews, friends and family too numerous to list but not forgotten. Harry is reunited with his wife Shirley Gertrude Simon and is predeceased by four siblings and two grandsons, Wayne Cook and Rodney Still. Friends can visit with Harry’s family at the Johnson County Funeral Chapel on Tuesday, December 11, from 6 until 8 PM. Funeral services will be held Wednesday, December 12, at 10:00 AM at the Johnson County Funeral Chapel. The internment will be Thursday morning at 10:00 AM with military honors. Donations may be made to First Baptist Church, 420 W. Main St., Cleveland, MO 64734, or Cleveland Lions Club (#10107) 204 W. Main Street, Cleveland, MO 64734.